Dangeous cars exist in many forms - from the innocuous Jetta TDI, any car with Takata airbags, or Ralph Nader’s nightmare, the Chevrolet Corvair - but those cars are accidentally dangerous. 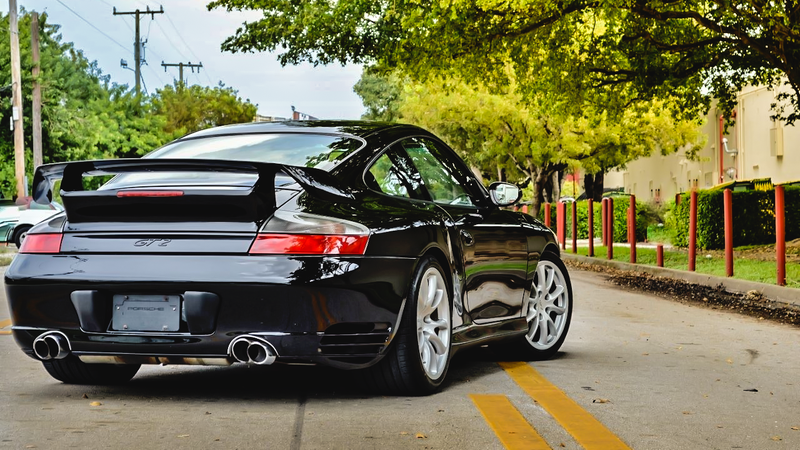 This Porsche 911 GT2 was made as a branded widow maker on purpose. Sounds like a great plan, eh? This Porsche 911 GT2 is a car that harks back to a day where every professional race came with an obituary service. It’s what happens when you take the already fast-as-a-cheetah-on-a-conveyor-belt 911 Turbo, give it more power, and make it rear wheel drive only. With the engine nestled behind the rear wheels, this means that snap oversteer is a real thing that can happen to an unassuming driver if they’re not 100 percent focused on the task of driving. This Porsche is also quite rare, with an original MSRP of over $200,000 and only 303 ever produced. This is an appreciating asset by any measure. It costs well into the six figures to buy today, but if you have some pennies socked away (several million of them), then I’d suggest picking up with exercise in vehicular lunacy. Inside and out this Porsche is in concourse condition. NO stories, bone stock, clean carfax, and every piece of paper since new including window sticker, all books, manuals, and two keys. Fresh open check book “fix-all” service with $9,800 receipt... New Clutch - Coolant Pipes Welded - Water pump and everything incorporated with that. Yes, this car can be dangerous to drive because of the insane amount of power pushed through a relatively light chassis’ rear wheels, but it’s no worse than a comparable Ferrari, except this car won’t put your kids into debt to fund its repair bills, which can be pricey, but not unreasonable. The engine is more stout than it ever needs to be and the 996 body style is helped along by the turbo aero tweaks and accents. It’s a car that grows on your aesthetic sensibilities, at least for me it does. Ultimately, it’s a rare exotic that asks: Are you good enough?